Set up a small table in the corner and tape a poster board to the front of the table. 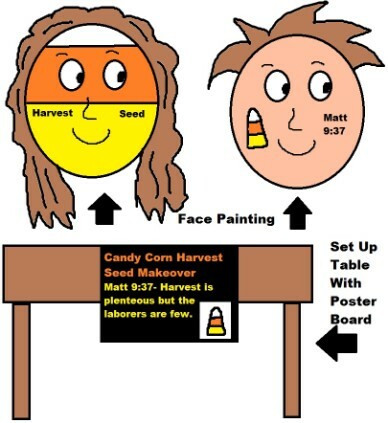 On the poster board write the word, "Candy Corn Harvest Seed Makeover" "Matt 9:37- The Harvest is plenteous but the laborers are few. Paint the kids faces white, orange and yellow using thick horizontal lines. Or you could paint a small candy corn on side of their cheek and write the words Matt 9:37 or Harvest Seed on the other side. We also have Fall Sunday School Lessons that comes with recipes, crafts, coloring pages, fall awards, and more.